Io [EYE-oh or EE-oh] can be classified as one of the most unusual moons in our solar system. Active volcanism on Io was the greatest unexpected discovery at Jupiter. It was the first time active volcanoes had been seen on another body in the solar system. The Voyagers observed the eruption of nine volcanoes on Io altogether. There is also evidence that other eruptions occurred between Voyager encounters. Plumes from the volcanoes extend to more than 300 kilometers (190 miles) above the surface, with material being ejected at speeds up to a kilometer (.6 miles) per second. Io's volcanoes are apparently due to heating of the satellite by tidal pumping. Io is perturbed in its orbit by Europa and Ganymede, two other large satellites nearby, then pulled back again into its regular orbit by Jupiter. This tug-of-war results in tidal bulging as great as 100 meters (330 feet) on Io's surface. The temperature on Io's surface is about -143° C (-230° F); however, a large hot spot associated with a volcanic feature measured about 17° C (60° F). Scientists believe the hot spot may be a lava lake, although the temperature indicates the surface is not molten. This feature is reminiscent of lava lakes on Earth. 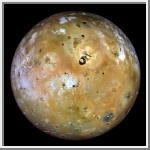 Io is composed primarily of rocky material with very little iron. Io is located within an intense radiation belt of electrons and ions trapped in Jupiter's magnetic field. As the magnetosphere rotates with Jupiter, it sweeps past Io and strips away about 1,000 kilograms (1 ton) of material per second. The material forms a torus, a doughnut shaped cloud of ions that glow in the ultraviolet. The torus's heavy ions migrate outward, and their pressure inflates the Jovian magnetosphere to more than twice its expected size. Some of the more energetic sulphur and oxygen ions fall along the magnetic field into the planet's atmosphere, resulting in auroras. Io acts as an electrical generator as it moves through Jupiter's magnetic field, developing 400,000 volts across its diameter and generating an electric current of 3 million amperes that flows along the magnetic field to the planet's ionosphere. Model of the Io Plasma Torus. See also: Galileo Images of Io. Voyager 1 computer color mosaics, shown in approximately natural color and in Lambertian equal-area projections, show the Eastern (left) and Western (right) hemispheres of Io. Almost all the features visible here have volcanic origins, including several calderas and eruption plumes that were active at the time of the Voyager 1 encounter. Io's volcanic plains are shown in this Voyager 1 image mosaic which covers the area roughly from latitude 60 degrees N. to latitude 60 degrees S. and longitude 100-345. North is up. Numerous volcanic calderas, lava flows, and volcanic eruption plumes are visible here. The composition of Io's volcanic plains and lava flows has not been determined, but they could consist dominantly of sulfur with surface frosts of sulfur dioxide or of silicates (such as basalt) encrusted with sulfur and sulfur dioxide condensates. The bright whitish patches probably consist of freshly deposited sulfur dioxide frost. This photograph of Io shows what appears to be a volcanic caldera that is venting gasses (the bright blue patch at left center). In the photo is a network of volcanic calderas with dark floors linked by bright red materials. The northernmost caldera has a bright blue patch on the floor. Scientists believe the bright blue patch may be clouds of gas issuing from volcanic vents. The gas clouds may condense to form extremely fine particles that appear blue. Since Voyager 1's infrared spectrometer has discovered sulfur dioxide on Io, it is possible that sulfur dioxide is the main component of the clouds. Sulfur dioxide clouds would rapidly freeze and snow back to the surface. It is also possible that dark areas in the floors of the calderas are pools of molten sulfur, a very dark form of sulfur. The image was taken March 5, 1979, as Voyager 1 approached Io, and was taken from 129,600 kilometers (80,500 miles).